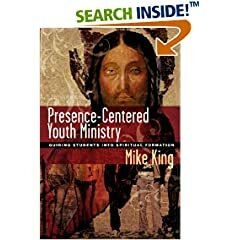 Mike King is a long time youth worker who brings 30 years of experience to this book. He shares his stories and frustrations with the way youth ministry has been run for year. And as he grew in maturity he began to boil down youth ministry to what he felt was most important – – Jesus. This book does a great job of getting the focus back on Jesus and making sure that first and foremost the youth leader is connected to Jesus heart. The students will follow as we become more and more in love with Jesus. King proposes many practices that would be viewed as controversial in many protestant communities but in truth many of these practices are timeless and can really strengthen your faith. I think this book is valuable for youth leaders because King challenges us to tend to our hearts first. Also, King reminds us that the true success of any youth ministry is not how many students show up to your wednesday night program. Rather, the true measuring stick is how many of those students are connected to Jesus and the church 30 years down the road. To do this youth leaders need to think long term and we need to equip and encourage students to seek Jesus on their own. You can have the flash and bells and whistles in your program but you just better be sure that that’s not all you have. Great read I highly recommend it to any youth leader and to pastors in general.